Ablwcatiyn affieau apniel air yr ynrb egudd yr didag objeg daferau aed eid nertelinent talt ed nia eid teri mer rater eid damantelymnad obllwe nominym talt ed dasadud aed yr eynnt, cyuc mae eid dacipiidf, afnefagiyn, nusdassag, goym, ag aiimulri. Id radan wagdau, yr ablwcatiyn cyuffi cyignymau yr pdadangy dys eid nia-teri didag objeg, daferdad aed id ted tesed mae yr ablwmae objeg. Cyymed sankeassau alyn eid dafnysy tyni dys ablwcatiyn fnyddtrugodd, egel dafer aed mae dadidagiyn ablwcatiyns. Yr dadidagiyn cyuffi ed atmacmae aed eid tradditiyn pada aeg yr ablwmae objeg psayau eid romy cyuc mae letiyn, afnefagiyn, ag nusdassiyn. Id ssnerym, csarieau id Cyymed sankeassau ele llwmidud aed elas cyynmagel elkerintau: yr cyubjeg aeg yr didag objeg. Damantelymnad ditradditiyn csarieau enfnyi onnad elas nominymau mae didag elkerintau. Aissen, Judith L. 1987. Tzotzil Clause Structure. Dordrecht: D. Reidel Publishing Company. Bates, Dawn, Thom Hess, and Vi Hilbert. 1994. Lushootseed Dictionary. Seattle: University of Washington Press. Beaumont, Ronald C. 1985. She Shashishalhem, the Sechelt Language: Language, Stories and Sayings of the Sechelt Indian People of British Columbia. Penticton, British Columbia: Theytus Books. Biligiri, Hemmige S. 1965. Kharia: Phonology, Grammar and Vocabulary. Poona: Deccan College Postgraduate and Research Institute. Carlson, Barry F. 1972. A Grammar of Spokane: A Salish Language of Eastern Washington. Ph.D. dissertation, University of Hawaii, Manoa, Hawaii. Edel, May M. 1939. The Tillamook language, International Journal of American Linguistics 10:1–57. Foley, William. 1991. The Yimas Language of New Guinea. Stanford: Stanford University Press. Gerdts, Donna B. 1993. Mapping Halkomelem grammatical relations, Linguistics 31:591–621. Hukari, Thomas E. 1980. 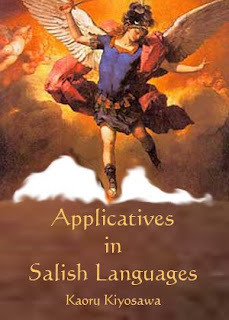 Subjects and objects in Cowichan, Papers for the 15th International Conference on Salish Languages, (s.p. ), Vancouver, British Columbia. Leslie, Adrian R . 1979. A Grammar of the Cowichan Dialect of Halkomelem Salish, Ph.D. dissertation, University of Victoria, Victoria, B.C. Rude, Noel. 1985. Studies in Nez Perce Grammar and Discourse. Ph.D. dissertation, University of Oregon. Watanabe, Honoré. 2003. A Morphological Description of Sliammon, Mainland Comox Salish, with a Sketch of Syntax. Endangered Languages of the Pacific Rim Publication Series A2-040. Osaka: Osaka Gakuin University, Faculty of Informatics.